A commitment ceremony is often very similar to many other kinds of weddings. The difference is that rather than being a legally binding ceremony, it is simply a public affirmation of a couple's commitment to one another. Generally, the couple is a lesbian, gay, or transgender couple, and thus are unable to marry under the law. The officiant welcomes guests to a celebration of the love and commitment between the couple. He or she will probably also say a few words about their relationship, or about marriage/commitment in general. This is the part where the couple declares their intent to be a committed or married couple. As in any kind of wedding, they will make promises about what that commitment means. They may promise to love in sickness and in health, in richness and poverty, till death do they part. Alternatively, they may write their own vows. 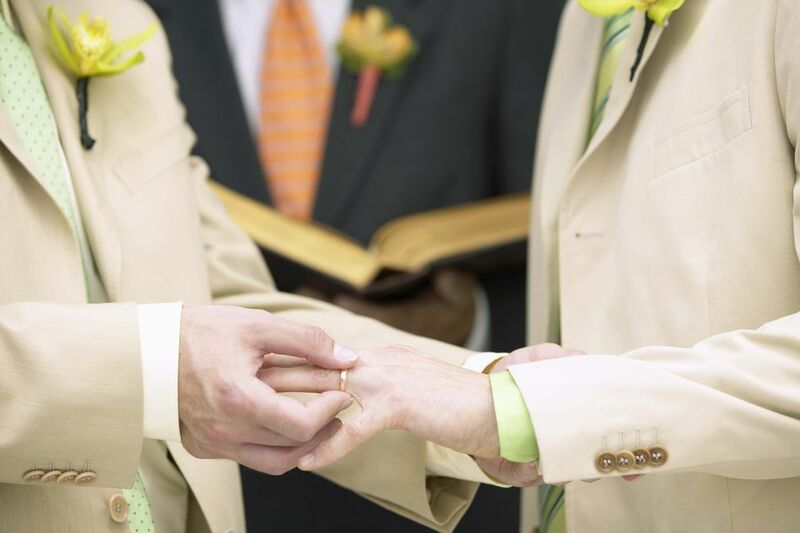 A religious commitment ceremony will likely incorporate hymns and scripture readings that focus on love. (Many religious officiants will have a standard set of music and readings that are often used at commitment ceremonies and weddings.) A secular ceremony will usually also include music and readings about love, including poems, passages of literature, famous quotes, personal writing, pop songs, and classic wedding music. It may be gay/lesbian/transgender-focused or very general, depending on the couple's personal preference. I'm honored to give you this ring as a symbol of the promises I've made to you today, and a proclamation to the world of the love I have for you. The officiant announces to the guests or congregation that the couple is now married (joined/united/wed - whatever word you prefer to say) and invites the couple to kiss. Some couples may not be used to kissing in public and thus may only have a very small kiss, or forgo this part altogether. Others will relish the moment to have the opportunity to kiss each other in front of their loved ones, proclaiming their love, and pride in having that love.